The first exhibition the Victoria & Albert Museum has ever dedicated to a single material shows its surprising origins and versatility. 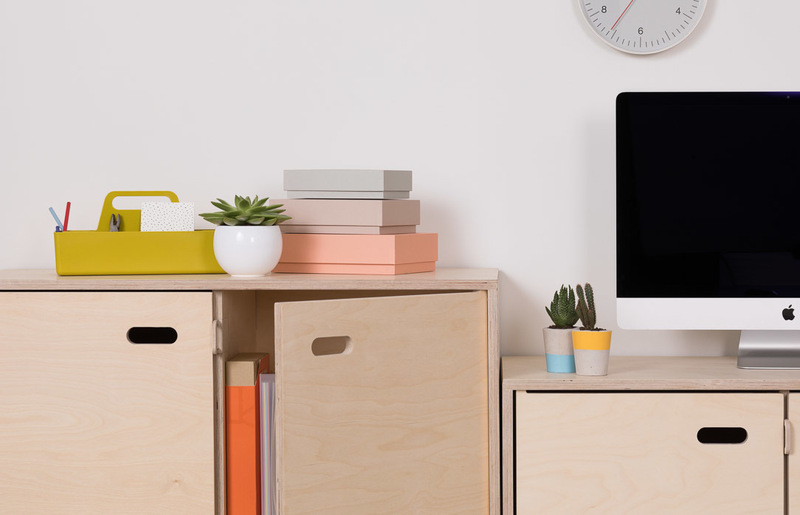 It also uses Opendesk as an example of a future-looking use for Plywood. 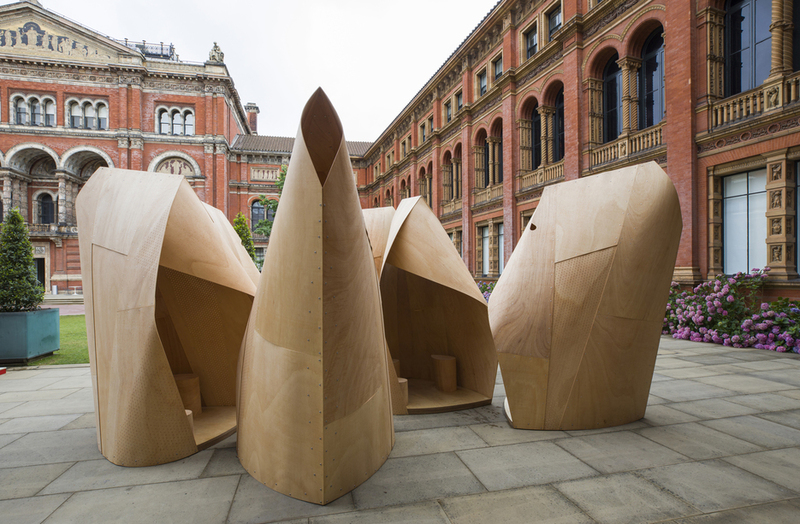 Opendesk was recently invited to participate in ‘Plywood - Material of the Modern World’ - a major public exhibition at the V&A. Free to visit, ’Plywood’ is a chronological walk through the history of a fascinating material: it’s rise, fall and subsequent re-emergence - alongside it’s myriad applications. The exhibition is showing in South Kensington until the 12th November 2017. Co-curated by the V&A’s Elizabeth Bisley and Christopher Wilk - Keeper of Furniture, Textiles and Fashion - it is a story of design (the exhibition shows the breadth of plywood’s use in the designed world, in the period since 1850), but also technological and social change seen through the eyes of a humble, yet surprisingly impactful material - beautifully told and accompanied by a book that adds a narrative of real substance. We’ve had a huge number of visitors, ranging from specialist designers and makers to a wide general audience. Lots of people have been amazed by the breadth of the exhibition, as well as the fact that it tells an almost unknown history of a very familiar material. It’s no secret that here at Opendesk we’re pretty big fans of laminated sheets of wood - and consider ourselves relatively knowledgeable about the material. But this exhibition really uncovers a largely secret and hugely fascinating history - both in a technological process and to certain extent, social progress. For the casual visitor, it’s a one-way journey through a cornucopia of objects and ideas held together by their common material property - although this is not necessarily evident without closer inspection. Arranged around a single central landscape of stacked plywood (what else?) plinths, it’s a tour that takes in everything from early skateboards to warplanes, modular housing to modernist furniture - with a detour into colonial (tea) crates, canoes and cars. Interspersed within the promenade are a series of ‘process moments’, the first of which introduces us to the industrialisation of the material that only became possible with the advent of the rotary lathe in the early 1800s. Suddenly veneers were no longer painstakingly saw-cut at great effort; rather, logs could be ‘peeled’ into paper-thin sheets of delicate veneer. Overnight the cost of the material plummeted and its availability rocketed. This wasn’t all good though. 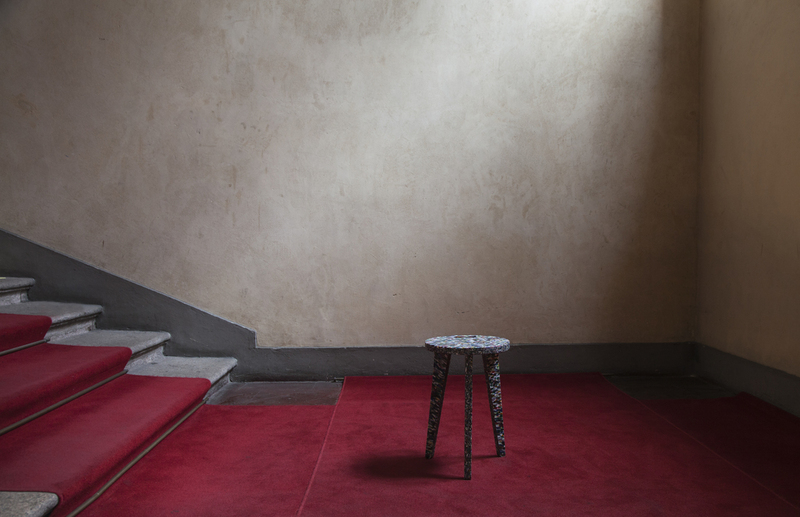 In fact the low cost and ubiquity, particularly in furniture of the era where it was used to to effectively wallpaper sub-standard material, ushered in the use of ‘veneer’ as a pejorative term. The second process moment sits alongside mid-century modern furniture from the V&A’s permanent collection: Aalto, Eames and Co jostle for position as we learn about the moulding of Plywood. It’s brought to life by a film showing the making of a beautiful 1937 Marcel Breuer chair being made by local manufacturers Isokon+ in their Hackney Wick workshop. 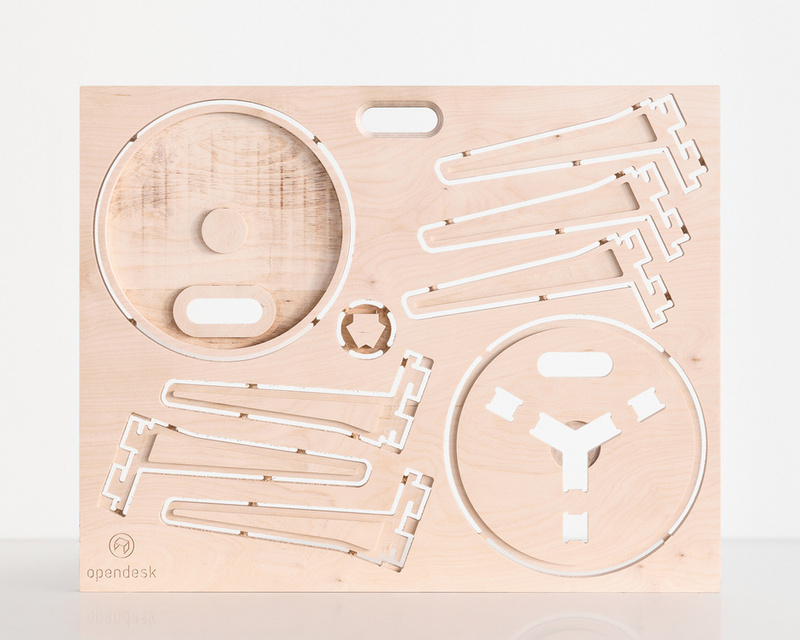 Opendesk features in the third and final process, highlighting the re-emergence of plywood as a material for the 21st Century; a humble yet flexible, universally available material for the digital making and distributed manufacturing of everything from Opendesk furniture to Wiki houses. 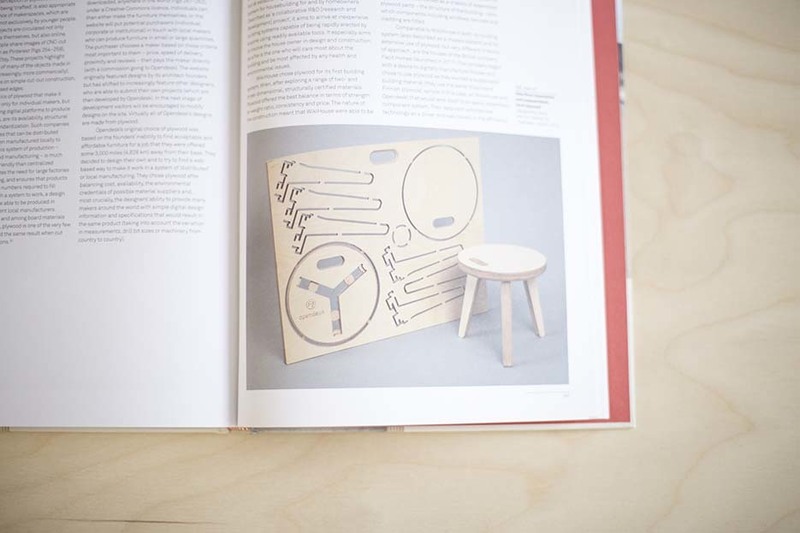 The V&A had already acquired the original (v1.0) of the Edie stool in both assembled and ‘airfix’ formats, and this was included in the exhibition to show a piece both finished and in its constituent parts, highlighting the translation from sheet to assembly. We can’t leave you without mentioning that the show also contains a rather wonderful group of ice skating shelters, designed by Patkau Architects in Vancouver and built at full scale in the V&A’s John Madejski garden, which visitors can sit in and amongst. It’s really worth the trek through the gift shop to find them! And without giving away too much more, we did want to mention a particular exhibition highlight - a scale model based on 1867 patent drawings for the design of an elevated pneumatic railway for New York; essentially an early version of Elon Musk’s Hyperloop - and designed to be made almost entirely in plywood! Opendesk: Hi Lizzie and Christopher, great exhibition! 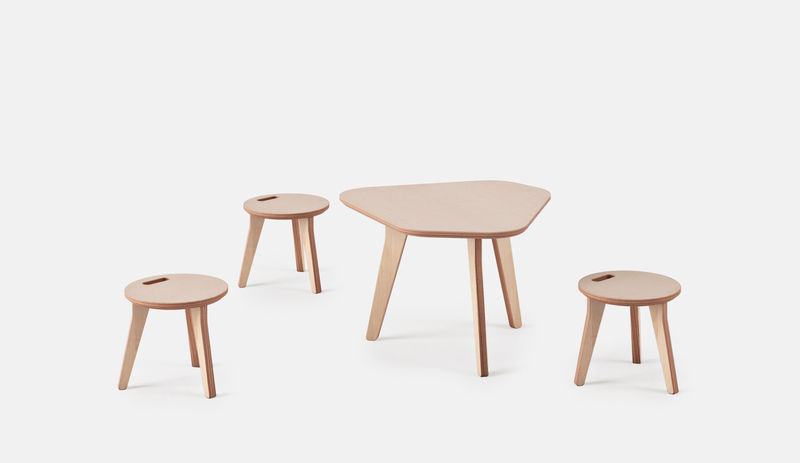 Where did the idea to focus on a single material come from, and why did you choose Plywood (vs any other)? Christopher: It began with Christopher’s research (in the late 1970s) into the 1930s and 1940s plywood furniture of Marcel Breuer and carried on in the context of other writing and exhibitions (including the V&A’s ‘Modernism’ exhibition in 2006). But in recent years the research shifted away from furniture and into the very long and complex history of plywood in the designed world. 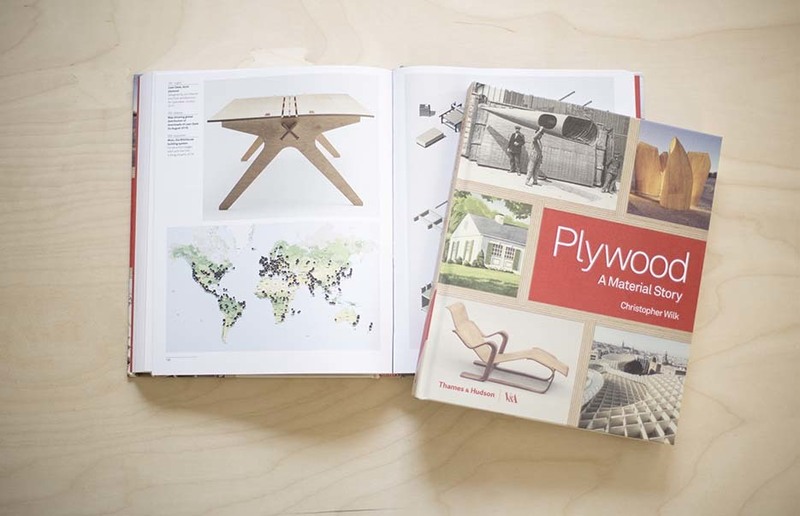 We love the fact that plywood has seen so many uses throughout its long history. What was the most unexpected use, detail or fact that you uncovered in researching this exhibition? There were many surprises. Among the most significant was that the invention of steam-driven mechanical saws (c. 1800) and then the rotary veneer cutter (from 1820) caused the price of veneers to fall, allowing them to be used in cheap furniture and for industrially produced plywood during the Victorian period. The result was that anything covered with veneer, including plywood, came to be seen as a cheap, sham material hiding something inferior beneath. Owing to this, the very word veneer entered everyday language as a word denoting superficiality or a sham appearance. Even today, furniture retailers and manufacturers use slogans such as ‘100% solid / 0% veneer’. Opendesk: What was the most tricky exhibit to get hold of? Any that you really wanted, but got away? Elizabeth: We always knew that we wanted to show how plywood had been used in car design. This was very difficult to do as plywood tends to be internal to a car’s construction and therefore not visible in the finished vehicle. It was fantastic that we were able to find two cars that clearly showed plywood’s use as an engineering material in the 20th century (a 1930s German car, cutaway to show construction, and a 1960s racing car with unused plywood body). In addition to the cars, finding a 1917 plywood canoe in Michigan was hard work! In terms of objects that got away – we had always wanted to include a whole Mosquito aeroplane in the exhibition but the plane’s long, single wing was too big to get into the museum. As an unusual topic for a major exhibition, how has the public reception been? The reception has been fantastic. We’ve had a huge number of visitors, ranging from specialist designers and makers to a wide general audience. Lots of people have been amazed by the breadth of the exhibition, as well as the fact that it tells an almost unknown history of a very familiar material. The exhibit itself is designed as stacked sheets of plywood that can be de-mounted and re-used - given a second life after the 12th November. Have you found a home for them yet and if so, where?! The sheets are going to be given to the Building Crafts College in Stratford, where they’ll be used by students on the furniture making course – there are plans for a class project based around a single sheet of ply. 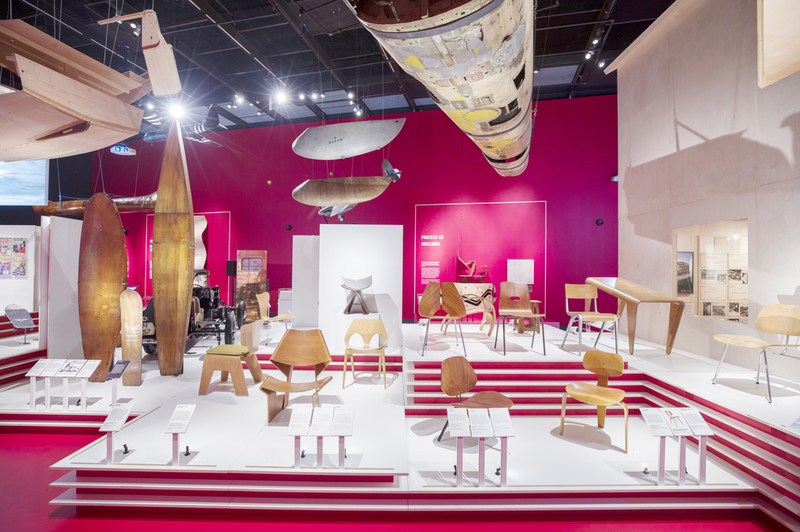 Plywood: Material of the Modern World runs from 15 July – 12 November 2017 at the Porter Gallery, V&A museum, Cromwell Road, Knightsbridge, London SW7 2RL. Entry is free. For more info, head to the V&A’s site. 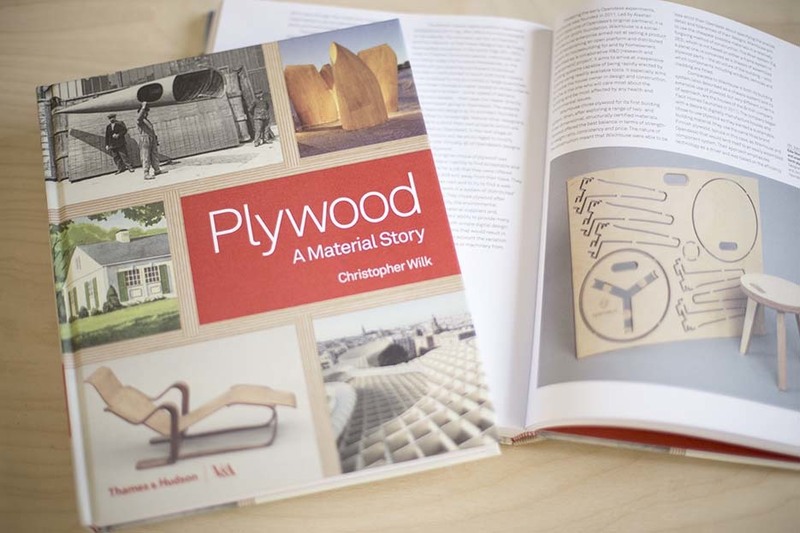 Plywood – A Material Story is available to buy through the V&A’s online shop. 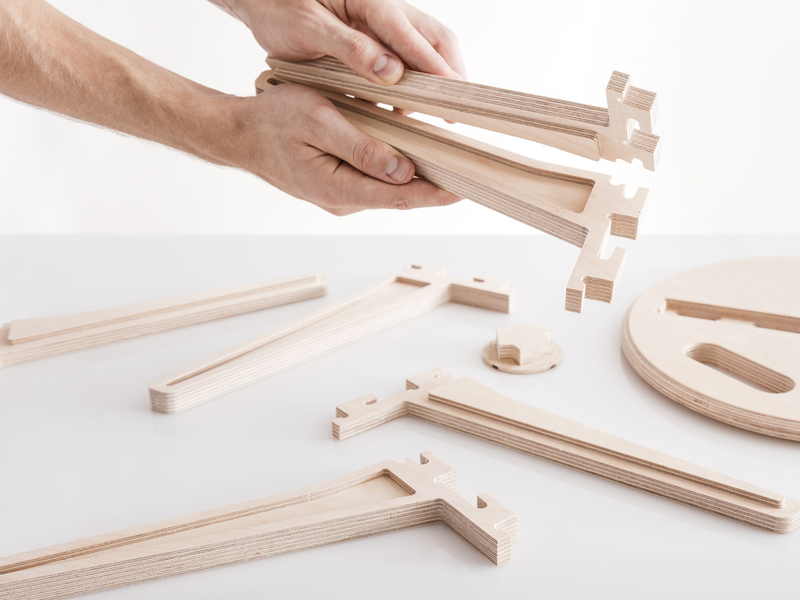 A clever modular storage system, developed in conjunction with DIY computer company Kano.